I almost died of cuteness when I saw Laura's Etsy Shop: Like Sewiously. She makes the cutest hairwraps and headbands. I knew that I had to have one and it was pretty easy to choose which one as one stood out to me..
Are you guys shocked? I thought not. How could I resist this one? 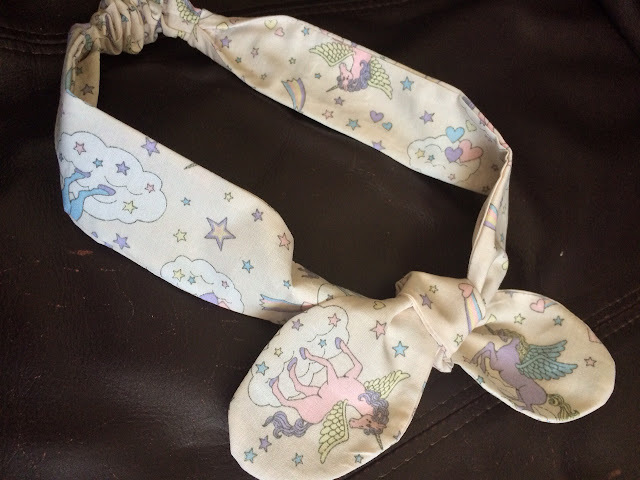 It's a creamy coloured fabric headband covered in rainbows, clouds, stars and unicorns. There is a small elasticated section at the bottom as well. The actual headband came untied which is useful as it means that you can secure the headband to the precise size of your actual head. This headband is amazing quality and I'm so glad that it's mine <3 Definitely check out Like Sewiously on Etsy, Facebook, Twitter and Instagram.